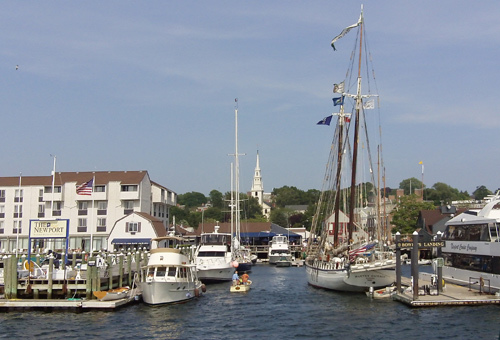 Newport Harbor Cruise - The Best Way to See the Sailing Capital of the World! The Best Way to See the Sailing Capital of the World! Amazing Grace, (which departs from Sayers Wharf, right next to The Mooring restaurant) and were fortunate to enjoy some great weather. 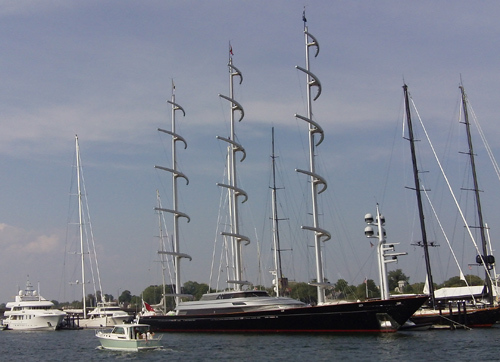 One of the first sights we came across was the Maltese Falcon, a 289 foot mega-yacht owned by hedge fund manager Elena Ambrosiadou. This monster has three self-standing and rotating carbon-fibre masts and 15 computer operated sails. It has a large crew, but can be operated by one person. She can accommodate 12 guests in five lower deck rooms and private cockpit. It also has a saloon on the main deck, two studio areas, a dining room and a sun bathing area. 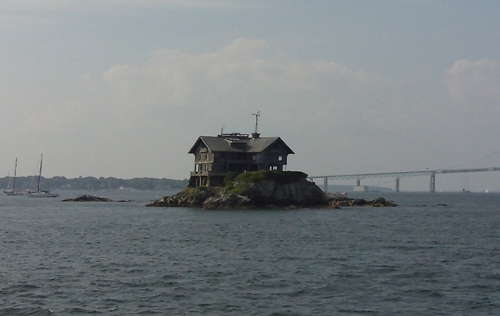 Next, we passed one of my favorite sites in Narragansett Bay, Clingstone. This house was constructed in 1905 for the Wharton family. After the Whartons passed away, it remained empty for decades until the Wood family came along and scooped it up for only $3,600! Clingstone - "The House on the Rocks"
At the southern end of the Bay you can catch a glimpse of Castle Hill Inn & Resort and the Castle Hill Lighthouse. This is one of the best spots on the island for accommodations, fine dining and wedding receptions. It's also a popular spot to watch the yacht races from. 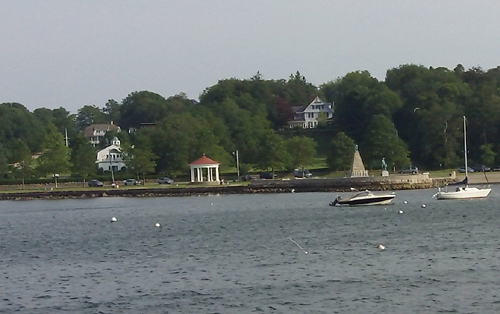 The first one is from the beginning of the cruise, with Newport Bridge and Rose Island Lighthouse in the background. Next up is Hammersmith Farm. This property was owned by Jacqueline Bouvier, and served as President Kennedy's summer White House in the early 1960's. The following clip shows the west and north lawns of Fort Adams. The north lawn is where the world famous Newport Folk and Jazz Festivals are held every summer. 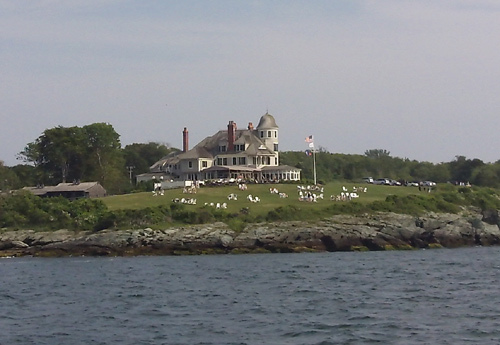 As you come around the east side of Fort Adams, you'll see the Museum of Yachting (on the right) and the Fort's Visitors Center. 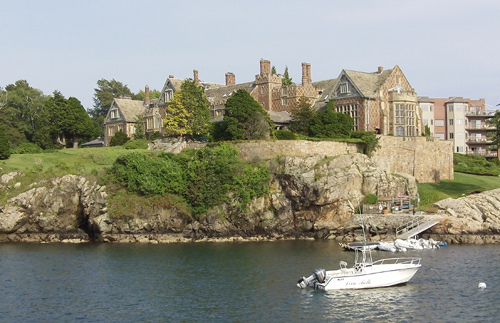 This next clip is of Harbor Court, site of the New York Yacht Club and home of the America's Cup for decades. 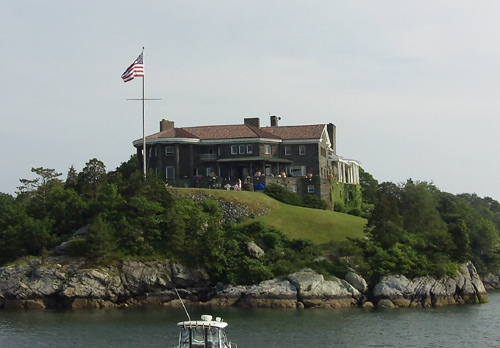 This last clip gives you a good shot of Lime Rock Lighthouse, site of the Ida Lewis Yacht Club. Beacon Rock (in the photo below), situated on 8 1/2 acres overlooking Brenton Cove, had a couple of well known designers: Frederick Law Olmstead (designer of Central Park) originally designed the grounds, and the residence was designed by McKim, Mead, and White. The photo below is Beechbound, designed by Peabody and Stearns in 1895. This Scottish castle was build for William Burden, a New York iron tycoon. In the photo below, you can see King Park in the distance. On the right, behind the boats, is the Rochambeau Statue and Memorial. General Jean-Baptiste Donatien de Vimeur, comte de Rochambeau was a commander of French forces who assisted George Washington here during the Revolutionary War. Below you'll see Forty 1 North (the white building in the center) one of Newport's finest waterfront destinations, with its state-of-the-art marina, hotel, restaurant and lounges. On the left in the distance, you can also see St. Mary's Church, where Jacqueline Lee Bouvier and John F. Kennedy were married in 1953. Finally, below, is the view at the end of our Newport Harbor cruise as the Amazing Grace pulls back up to the dock. 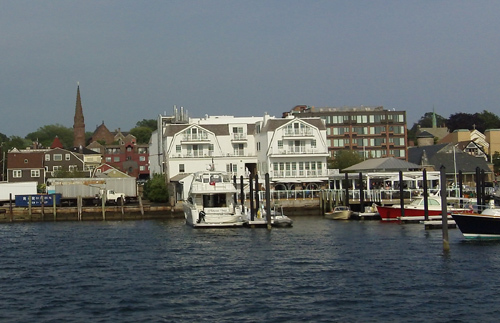 The Newport Harbor Hotel and Marina is on the left, and Trinity Church can be seen in the distance. 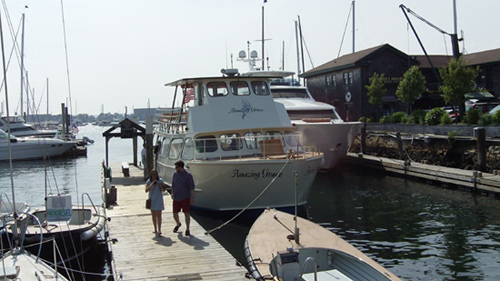 If you're looking to do a Newport Harbor cruise, I definitely recommend the Amazing Grace. The rates are affordable, the guide was great and they're easy to find. You can purchase tickets from the woman at their booth, which is located right on the sidewalk on America's Cup Avenue, in front of The Mooring restaurant.